Wednesday night, over 20 new works were presented at the Plavin dance performance space. Our young dancers shared solos, duets and group works they created over the course of the past three weeks. 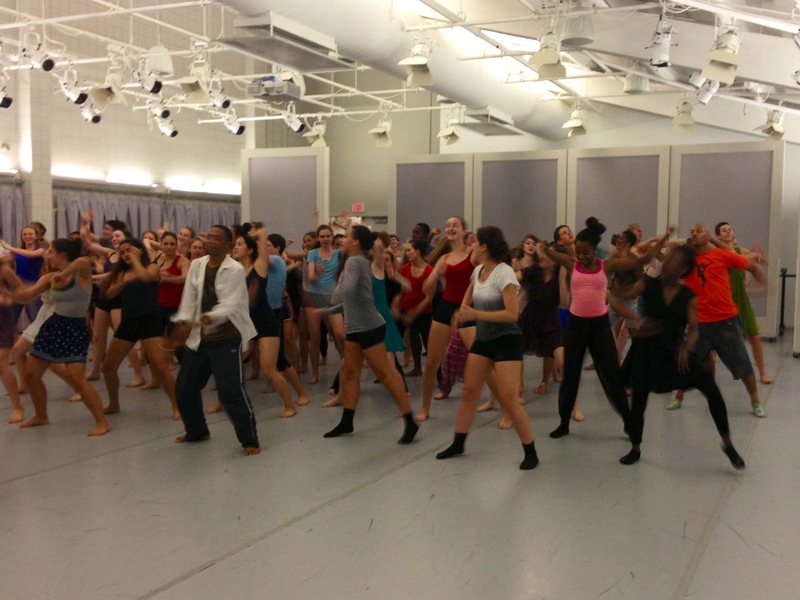 The Young Dancer’s Works-In-Progress Showing is always a highlight of the workshop. Students have an opportunity to choreograph work, dance in their peer’s pieces or join one of the counselor choreographed group works. It is amazing to see the varied works that our students come up with. Many different styles, interests and personalities are all put onto one stage for the evening. 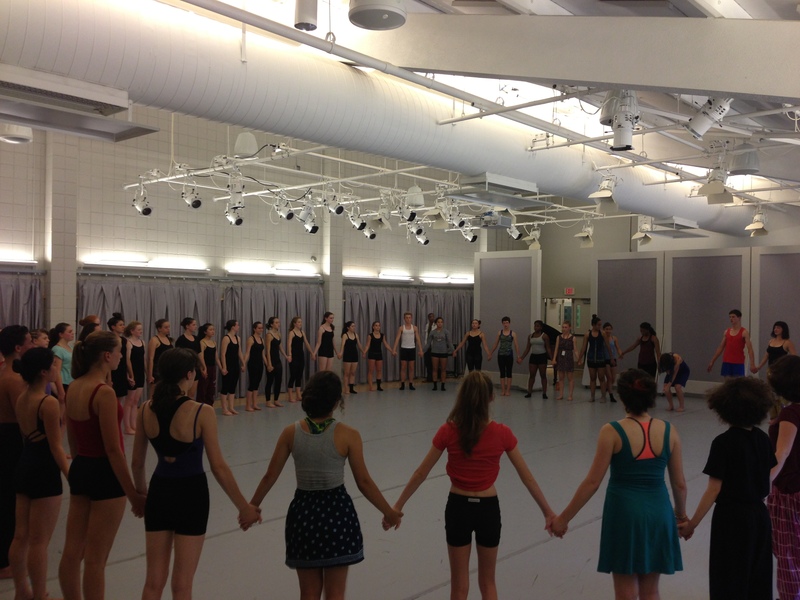 All our young dancer’s gathered around for a pre-show warm-up. It was thrilling to see so much of what our teachers and counselors have been working on in classes and workshops show up in the works. I was especially impressed by the attention to partnering that was highlighted in almost every one of the pieces. So many of the works explored partnering and lifts with such bravery and care. I saw a lot of what Karl, Kendra and Nejla have been working on in their classes, having the students improvise using partnering scores. Rolling points of contact, counter balancing and using strong bases for partnering showed up over and over again. Our students also bravely stepped into the weird and bizarre in many of the pieces. Dressing each other in thrift store clothing, contorting their faces and eating a whole tomato, were some of the more daring moments of the show. I loved watching our students hurl themselves into these weird situations on stage with great commitment and energy. All shows must end with a dance party! This show was a great way to bring the community together for one last time. In our hall meeting that evening, our students reflected upon things they liked best about this program. Each student noted different experiences but the sense of community at Bates is what was most valued. I am glad our students have a safe place to learn more about themselves and each other. This night was a true reflection of the amazing talents of our diverse group of young dancers.